Serpents (nagas) are credited with the power to cause rain, bringing forth growth and abundance. Because they shed their skins, they are also considered symbols of regeneration. In Indian art, serpent deities are often represented as humans with snake hoods. The importance of this figure is conveyed by his frontal pose, his monumental size, and the seven-headed snake hood that rises above him like an enormous canopy. The protective canopy of seven cobra heads tells us that this 2,000-year-old figure is a Nagaraja, or serpent king. During the course of time, the surface of this soft sandstone sculpture has suffered considerable damage. It is known to have suffered from water erosion, and was probably buried for some time. The snake-god has been revered from ancient times, by Hindus and Buddhists alike. Nagarajas are usually placed in open shrines, and as shown here, under a tree. Nagas, or snakes, are still venerated all across the Indian subcontinent. Cunning, wise, and, above, all, dangerous, serpents, especially cobras, are considered descendants of the snake-king. Nagas are the patron saints of waterways, and are said to guard the sources of water and the treasures that lie deep in the earth. 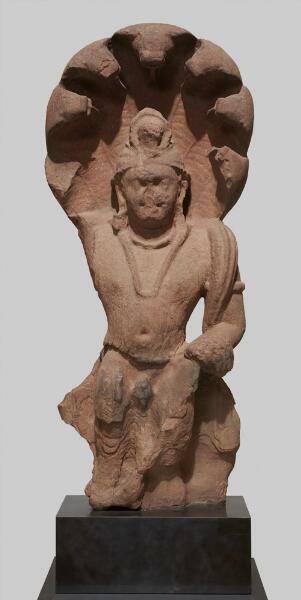 The snake-god may have been the focus of an independent cult in the city of Mathura in northern India, where this figure comes from. In this region, during the Kushan period from the first to the third centuries, artists made some of the first known stone representations of the Hindu gods. This figure's jewelry, turban and long scarf are all characteristic of the Kushan period. Think back to what school was like last year. Seems like forever ago, right? Well, how ‘bout we multiply that by, say, 2,000. That’s about how long this statue has been in existence. Sssssseems like a very long time ago. Wh-- … uh, who said that? Me, the ssssnake at the very top of this sssstatue. I don’t see a snake. All I see is this man, with a very large hood of some kind. Ah, then you’re looking in the right placccccce. Look at the edges of that hood. Those figuressss peeking over. We are serpentsss, or snakesss. Can you see our tongues? Yes, I see now! So who’s the man? He is a serpent god. He is shown with snakesss because we are considered very powerful. They say we can bring rain, and help the plantsss grow. I can see his power. He’s huge! And his shoulders look very strong. But he’s missing an arm, a hand – what’s up with that? Wow, if I could survive all that time, I hope they’d put me in a museum too!